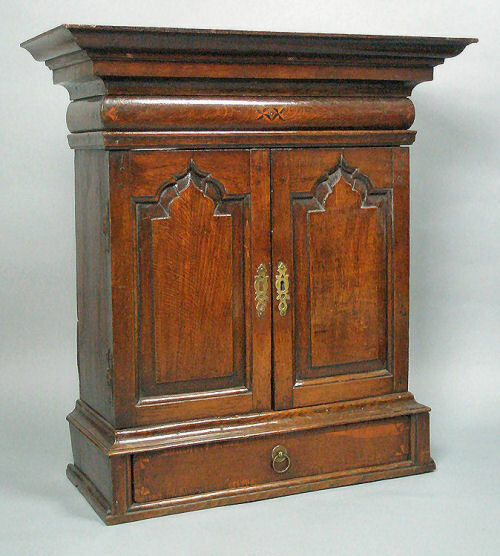 It was because of its extreme resilience and toughness that native oak was less favoured for furniture-making – the staple oak employed by cabinetmakers was not home-grown. Even before the Navy – ‘The Wooden Walls of Old England’ – decimated the nation’s indigenous oak forests, wainscot  was being imported from the Low Countries (when England wasn’t at war with the Dutch) in enormous quantities both as logs and quarter-sawn boards. 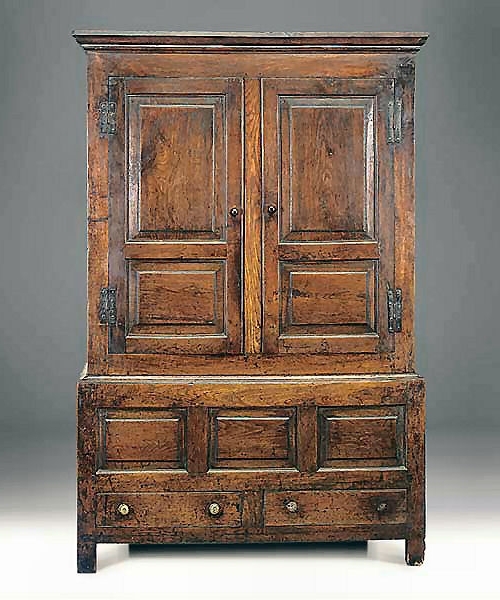 Eighteenth-century cupboard of native English oak. Wainscot’s typically straight, close-grained and knot-free character was more kindly and thus easier to work than native oak. The imported quarter-sawn boards revealed the renowned medullary rays which were widely considered wainscot’s most desirable feature – and an attribute often mimicked, especially with internal joinery, on deal and inferior woods by the use of stains and glazes (scumbling), even up until the mid-twentieth-century. The dense, slow growing wainscot oaks (Q. robur and Q. petraea) originated either in Germany and were shipped to the Netherlands via. The Rhine, or, in the Baltics and were shipped or floated to the Zaanstreek (Zaan district – between the North Sea and the Zuiderzee). The Dutch had a well established sawmilling industry dating from the sixteenth-century which was dominated by sophisticated paltrokmolens (wind-powered sawmills). 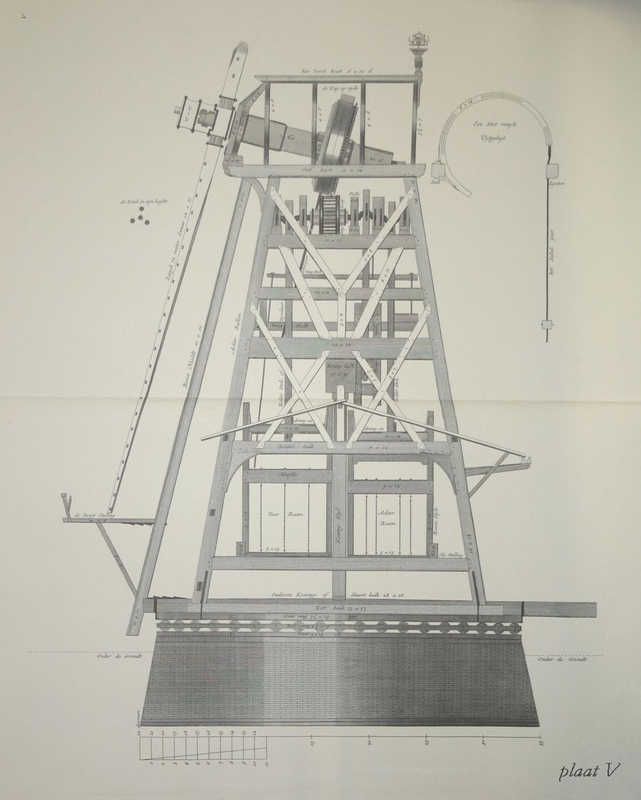 The enormous mills employed wind-power for virtually every aspect of the elevating, loading and sawing process. Wind-driven crankshafts and connecting beams powered up to four individual gang saws; each with between six and ten reciprocating saw blades. By the 1730s, the Netherlands boasted around 450 paltrokmolens. The sawmills were affectionately known by nicknames, usually pertaining to their prowess: One paltrokmolen built in 1734 was named ‘Het Amsterdamsche Wapen’ (The Amsterdam Weapon). Drawing of the internal workings of The Amsterdam Weapon, showing the vertical gang saws, circa 1734. The Dutch were also highly adept shipbuilders, possessing one of the largest merchant fleets in Europe. Wainscot was shipped in broad-hulled noortsvaerders – a type of fluitschip with a unique hole in the stern that allowed easy loading and unloading of long timbers. With the onset of the fourth Anglo-Dutch War (1780-84), shipments of wainscot from the Netherlands ceased, but the ever increasing demand for wainscot was met by Russia through the port of Riga on the Baltic Sea. Between the years 1785-1796 almost all of Riga’s annual average of 20,000 wainscot logs was shipped to British ports. The appeal of wainscot during the eighteenth-century was reflected in its price; commonly twice the cost of native oak. The London trade (and that of the districts around the main provincial ports) used wainscot exclusively when oak was required for carcases (solid and veneered), drawer linings, seating, tables and, of course, wainscoting. William Marshall, On Planting and Rural Ornament a Practical Treatise, Volume I, London, 1796, p.51. “Upon the whole, it may be said, that, in the construction of a ship, Oak is the only English Wood made use of; and that, of this English Oak, nearly two -thirds are requisite to be more or less Crooked”. Silva: or, A discourse of forest-trees, and the propagation of timber in His Majesty’s dominions, as it was delivered in The Royal society, on the 15th of October 1662, by John Evelyn, third edition, volume 1, York, 1801, p. 106. The legend ‘THE WOODEN WALLS OF OLD ENGLAND’ was inscribed, around a ship on the obverse of the Duke of York halfpenny, struck in 1795. Estimates of between 1,000 and 3,000 oak trees, or fifty to one hundred acres of oak forest were required to build a single ship during the seventeenth and eighteenth centuries. A Dutch or Low Country term which has been in use in England for many centuries, but now imperfectly understood. Its original form was Wandschote (from wand, a wall, and schotte, to defend or preserve). The preserving agent was here wood in the form of boards (literally wall-boards). Timber Technicalities: Being Definitions of Terms used in the Home and Foreign Timber, Mahogany and Hardwood Industries…, William Rider and Son Ltd., London, 1921, p. 153. Herbert H. Kaplan, Russian overseas commerce with Great Britain during the reign of Catherine II, American Philosophical Society, Philadelphia, 1995, p. 224. Formerly from the UK, Jack is a retired antiques dealer and self-taught woodworker, now living in Australia. This entry was posted in Furniture Timbers. Bookmark the permalink. Let me add to my recent endorsement of your approach my appreciation of etymology! All of a sudden the strange sounding word “Wainscot” makes perfect sense and with a most familiar ring to it, too. “Wand” still means wall in German and the verb “abschotten” means to divide from in order to protect; et voilà! Where are those magnificent plates (or plaats :-)) of the paltrokmolens to be found? Thank you for affirming the etymology of wainscot – I understand the Dutch and German languages are related. I’m uncertain where I sourced the image of the paltrokmolen. I have a hard drive full of interesting images that I scan or glean as I can. I have a feeling there are more of them and that they came from an eighteenth century book on the subject. I can tell you I don’t own the book, but I may have more paper scans somewhere. I’ll be writing on the subject of timber conversion and sawmills at some juncture. Wind powered sawmills. Why did they disappear and why aren’t they back in use? Another testament to the amazing Dutch. When white settlers appeared in northeastern North America, where I live, they had early on no sawing technology to make boards of the massive timbers of the Oak and Chestnut virgin forest. The wood that they could work for commercial purposes was White Oak. It was split and used for barrel making and sold for the rum trade in the Caribbean. In Spike Carlsen’s book “A Splintered History of Wood” there is a fascinating section on Oak: The Breakfast of Civilizations. Another very interesting post; thankyou for sharing this knowledge. I’m really drawn to the spicebox you show; any additional information on it? I’d certainly like to build a reproduction. I can’t tell you much about the spice cupboard other than it was made in the first half of the eighteenth century and is 28 ins. high, 26 ins. wide and 11 ins. deep. Hmmm… I thought “wainscot” was a paneling system for walls, but you seem to use it in reference to the wood itself: “Wainscot Spice Cabinet”, “the Wainscot Oaks” etc. Looking at the etymology of the word, I wonder if it’s a reference to the quality of the oak, perhaps Dutch or German in origin? As mentioned in the post, wainscot is a Low Country word. Wainscot was widely used for low wall panelling and through time, gave its name to the panelling itself. This is an interesting post. I have two remarks: ‘wapen’ as used in ‘het Wapen van Amsterdam’ means ‘coat of arms’, not ‘implement of war’. I doubt it refers to the city’s prowess. And ‘schot’ more properly translates as ‘protection’, being derived from ‘schutten’ meaning ‘to protect’. The wooden panels protect the walls from damage (these would have been plastered otherwise). They also protect furniture from being damaged by rough walls. I am not conversant with the Dutch language, however, I am informed by a Dutch friend that ‘het wapen van Amsterdam’ translates to ‘the arms of Amsterdam’, but she assures me that ‘het Amsterdam wapen’ does indeed translate to ‘the Amsterdam weapon’. Follow the construction of paltrok wainscot-sawmill “Het Amsterdamsche Wapen” on the website of Penterbak scale model builder of Dutch windmills. Other than where noted to the contrary, the content of this blog belongs to Jack Plane. If you abuse the content in any way whatsoever or copy any part of it without Jack’s express written permission, various parts of your anatomy – according to an ancient Irish curse – will wither and drop off (or at the very least, some awful legal trouble will befall you). Copyright © Jack Plane, all rights reserved, MMIX – MMXIX.